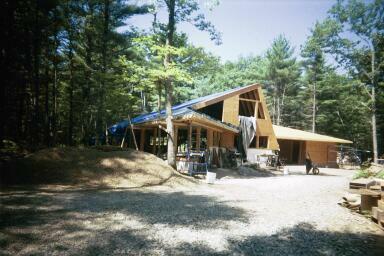 This site is offered in support of the cause of Organic Architecture. Frank Lloyd Wright and many others have influenced the Principles expressed in the architecture I have designed and built. GASTON HOUSE on Hurricane Island, Maine. CLICK AT TOP or BOTTOM OF ANY PAGE ON Built Projects for MORE PHOTOS of this House and others. 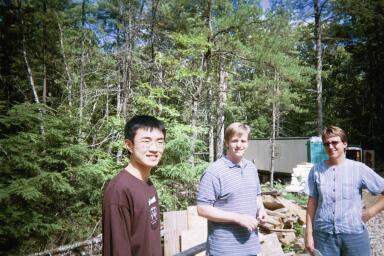 Three apprentices here for the summer of 2003. Chun Yiu Fu, Steve Knox and Peg Hartz. Chun Yiu is now attending IIT and Peg and Steve continue to work with me on Fridays while they continue their studies at UMA architecture program. 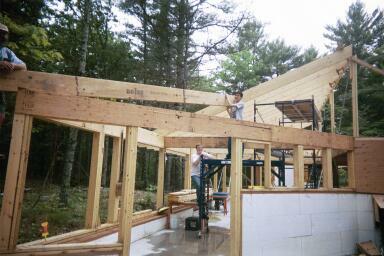 We are starting new design projects here in Maine and in West Virginia. The process of creation, or how long does it take to design and construct an original work of architecture. Rasmussen House UNDER CONSTRUCTION See construction photos. Rasmussen House What goes under the Radiant heat floor of a slab on fill. Work done week of May 14 - 22, 2003. 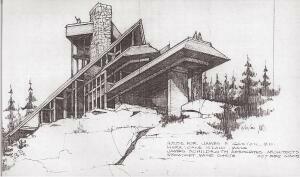 DESIGN WORK AS AN APPRENTICE AT TALIESIN 1959-1961, FRANK LLOYD WRIGHT FOUNDATION. STUDENT DESIGN WORK AT THE UNIVERSITY OF OKLAHOMA 1961-1965. CLICK at the top and bottom of each page to view other pages and navigate the site. This Web Site was first published, November 23, 1998. I offer it as an introduction to my architectural work and the philosophy from which it was created. 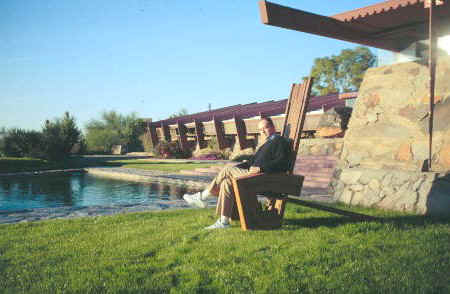 JAMES SCHILDROTH at Taliesin West. Don't miss the other parts of this Site: Built Projects, Unbuilt Projects, History, Essays and Services pages. Just click on the link names at the top and bottom of each page. "Organic Architecture develops from within outward - in harmony with the conditions of its being - as distinguished from one that is applied."